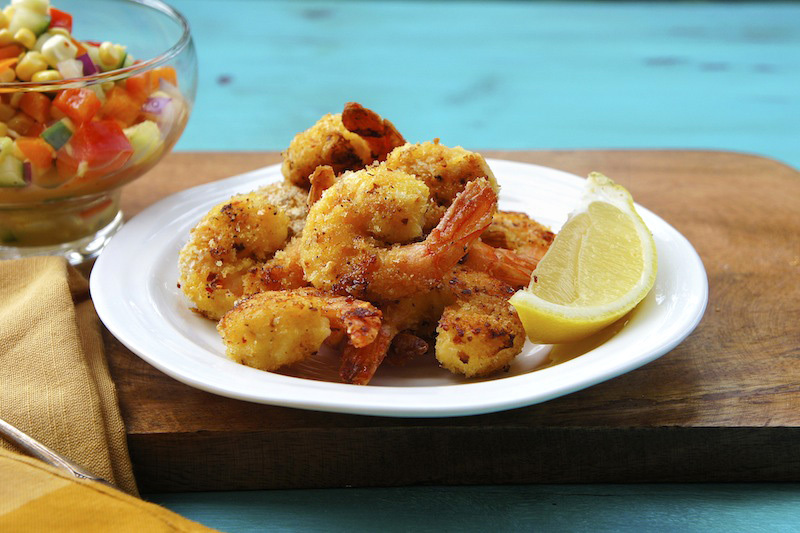 This Lemon Garlic Shrimp is a great appetizer to any meal or served as a light snack with some salsa. The crispy Panko breadcrumb coating added more flavor and texture to every bite of the tasty fresh shrimps. Just sprinkle some salt and squeeze some lemon juice onto the shrimps before serving. Yummy. In a medium bowl, mix together the breadcrumbs, lemon zest, onion powder, garlic powder, chili flakes, and some freshly ground black pepper. Pour the oil onto a large baking tray, and place in the oven for about 5 to 6 minutes. Meanwhile, toss the shrimps into the flour and shake off the excess flour. Then dip the shrimp in the beaten eggs, and then into the breadcrumbs mixture, making sure to coat shrimp well. Remove the baking tray from the oven and arrange the shrimps in a single layer and bake for about 8 to 9 minutes turn the shrimps over and bake for another 4 to 5 minutes until golden and crispy. Remove from the oven, and sprinkle some salt on the shrimps and serve with some lemon wedges. This looks like a great way to make whole prawns go a little bit further. Do you peel prawns or buy them peeled? I always feel like unpeeled prawns are better quality - fresher and plumper but I get frustrated with the work involved. I use ready peeled prawns. This looks wonderful! Crispy battered shrimps but not fried. Love the idea! Definitely going into my recipe list. Thanks! Do you really need to bake the shrimp that long? Yes, I need about 12 to 15 minutes to baked the shrimps.